I've already made contructive purposes and many other people here but is always the same. I would appreciate the staff darwinex give an answer to the questions . The idea behind the forum is not to ask questions to the Darwinex team, there are other means for that purpose. The forum was enabled for members in the Darwinex community to interact with each other and improve their trading / investment decisions. Sorry if we failed to explain this properly. It is placing smaller trades. Re scalability & divergence, please note that they are different measures. On the one hand, divergence displays divergence actually experienced by investors replicating the DARWIN's last 100 trades. It's, so to say, an "empirical" figure. Scalability, on the other hand, is an estimation of the volume a DARWIN could afford without suffering a large divergence. That estimation is based on the last 3 D-Periods. Scalability and divergence are hence different measures. The fact that its divergence is improving lately may produce an improvement in its scalability score, though. A concrete case of massive negative divergence on Darwin DCD. I contacted support to find out why the investment is still allowed. For educational purposes, I share with you Bianka's answer. We'd be happy to do this and protect current investors if investor volume was the issue behind DCD's degraded divergence. The reason behind real divergence of DCD is the fact that it trades during the night and especially around rollover time. Specifically, a few number of trades with high divergence are mainly responsible for current real divergence and the fact that there is such a big difference between average and median divergence per trade. This is why closing DCD for new investment would (currently) not protect investors from degrading divergence. New Darwins: very optimistic modeling of the divergence! True, the divergence is large, but the investors in that Darwin (I'm not one of them) are still doing well. So I suppose it is up to individual investors whether that matters to them. At least it is transparent, for all to see and make their decisions. Additional information: the decision to make a Darwin non-investable is human, not automatic. I noticed that on the long run FDU's new positive divergence turned into a good scalability score of 4. What about VQG ? His score is 4 but divergence is quite bad, -1% or worse. $VQG has about $510K investor volume while $FDU has around $225K. Other than that we don't know how much money is traded on those strategies outside of Darwinex. If a strategy constantly exits with take-profit it will have a better divergence than strategies commonly exiting with (trailing) stop-loss. Ok, ok...The new IAs are better, i agree with this ... except the Capacity, always a bad info for me. From 0-10: “Capacity” measures if the DARWIN’s percentage performance falls as its number of investors grows. The higher the score, the more capital the DARWIN should be able to handle without its returns being affected by the divergence. Right or False ? SHOULD !! Too, WHY a Day-Trading or Short term Strategy will have a BAD Capacity ? When you look the divergence of the strategies, your expectancies are not right, so you say SHOULD but you give a note and impact the D-score if The Capacity was included, the D-score.1.0 not included the Capacity and now ? For me, your IAs must be right and not "should", "perhaps" etc so i give you to calculated the divergence on right facts: The investors divergence ! Why hedge funds hold their trades for weeks? To have an high capacity and manage hundreds of millions, even if that leads to drawdowns that can last one year. If you scalp you will have a low Capacity. If you are using a trailing stop you will have a bad R+. The good news are that all of these are nouances in new D-Score. If you experiment with filters you will notice that Ex Pf Mc Rs and Ra matter much more than the remaining nouances. Yes but Not..the IAs are calculated on TRUE datas ! Not the Capacity. A bad entry is a bad entry, a negative excursion more large than the positive face is a bad excursion, etc Not the Capacity. the D-score.1.0 not included the Capacity and now ? Capacity is exactly as the former Scalability, same charts/diagrams. It is just like the capacity of a bottle, bad divergence may occur when the bottle is almost full, if the bottle is almost empty there is no divergence but that doesn't change the capacity of the bottle. Capacity is calculated on the duration of trades and the liquidity of the market, that are true datas. In your opinion hedge funds with hundreds of millions of AUM are trading intraday? If you like to trade intraday it is ok but do not criticize the reality of the market, you cannot trade 100 millions with 20 pips trades. "The higher the score, the more capital the DARWIN should be able to handle without its returns being affected by the divergence." 2. Total AuM. Naturally, negative divergence increases once you trade more capital. 3. Trading Strategy. If the trader constantly exits with stop-loss orders (trailing) he will have higher divergence than someone who exits direction of the market (take-profit). 4. Market Phase. If the trader is a news trader trading very volatile movements he might have higher slippage as well as pre-Asian scalpers trading low liquidity markets. The capacity attribute is just an indicator of how much capital a strategy can handle. You can't know this for sure because of the mentioned uncertainties. HF exists in pure day-trading. CTAs too ! What's the problem ? Forex is liquid, some futures too. I say and confirm that the IA "Cp" is a joke for a darwin. Capacity = SHOULD not the reality. I use the IA"Cp" to filter the intraday darwins but i am not appreciate the SHOULD. Nota: I could trade 100M$ with no leverage for begin ! A Limit Order = Market Maker ! But i cannot trade with Darwinex lol. I say, and confirm that if you trade the market with LIMIT order, you become a market maker. and your divergence will be positive ! It's normal. Maybe but you cannot speak about divergence as long as you don't have a big AUM. I am not speaking about HFT machines, I am speaking about investable funds with a public and verified trackrecord. It is the reality, if you always trade at Limit order, not at the Market, your divergence will be positive cause you will be considered as a market maker. You broker could be great with you, hihi. 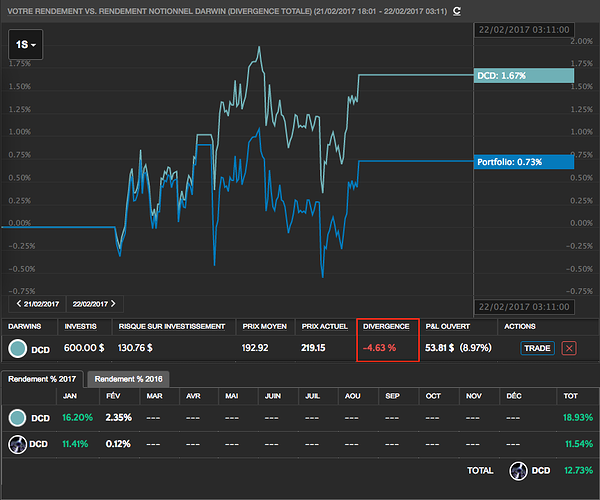 The investor monthly divergence is an estimated value based on the last 100 trades with duration lower than 400 ms. The divergence shown in your portfolio is real. I recommend that you watch the following short video: https://www.darwinex.com/education/video/PLv-cA-4O3y97Yv3uQuKzqmjo29v48sYqg/nsHNSVnv87Y to understand the concept. So why indicates on the darwin an ESTIMATED value ? As an estimated maximum AuM (Capacity) ? What is the positive things ? Nothing for me, just not the true. Dwx could indicate the REAL divergence on the real portfolios (an average or median) and if ther s not investors let the divergence blank. 5 - The broker's relationship with liquidity providers and the underlying depth thereof, as well as the technology that underpins this. 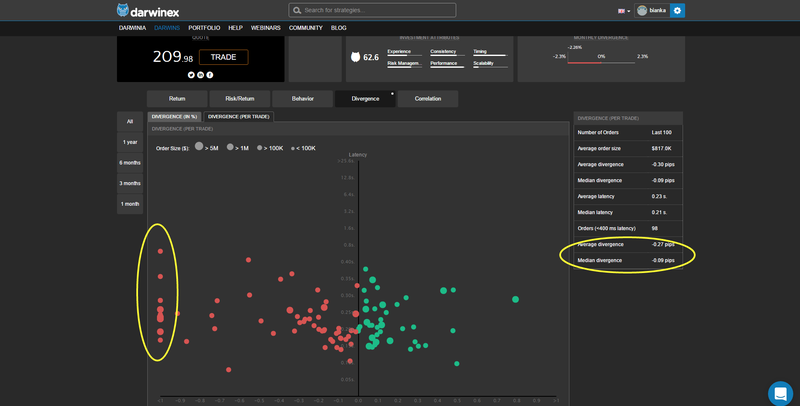 As far as technology is concerned I am referring both to how quickly liquidity can be accessed as well as how quickly trade replication takes place on Darwinex's platform itself.